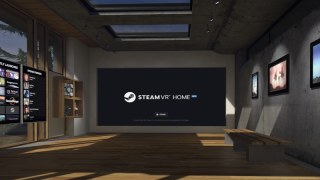 Steam’s new VR loading screen, SteamVR Home, has just launched into beta and it includes a host of new upgrades including the ability to invite friends into your space with you for multiplayer interaction. SteamVR Home replaces the platform’s loading screen - currently an open-space surrounded by an impressive space nebula - that anyone who’s used an HTC Vive headset will be familiar with. SteamVR Home is, by comparison, much more home-like. The environments can be customised thanks to Steam Workshop support, and once you’ve found one that you like you can then proceed to add props or 3D paint your own additions into the space. However the most interesting part of the new platform is that you’re free to invite others from your friends list into your VR home. We’d hope that this sort of functionality will someday make SteamVR Home into a virtual lobby for multiplayer games, much in the same way as Rec Room puts its players into a shared environment before multiplayer games such as paintball begin. For now however your interaction with others mainly consists around customising your avatars using an array of props and accessories. For a full list of SteamVR Home's features, check out Valve's site. If you’d like to try out SteamVR Home for yourself then you’ll have to opt into its beta. You can find the option to do so by going to SteamVR in your library, going to its properties, and selecting the SteamVR Beta from the betas tab. These are the best VR games available right now.